The Phillips’ Fast started November 15 and concludes December 24. His Grace, Bishop John, grants a dispensation from the fast and abstinence on the day after Thanksgiving (Nov. 26) to the clergy and laity of the Eparchy of Parma. May we always have a grateful heart and come into His presence with Thanksgiving. The brunch is today, Sunday, November, 21 following Divine Liturgy. Come with an appetite! It is the intention of Marcus Jon Loidolt, son of Melvin & Catherine Loidolt to take in marriage Kimetha Gwen Steele, widow and daughter of Eugene & Dorothy Pottgieser in marriage on the 30th day of April 2011, here at St. Athanasius the Great Byzantine Catholic Church. The next parish work day is scheduled for Saturday, December 4. It is being referred to as the St. Phillips Fast Day of Service and Recollection sponsored by the St. Athanasius Maintenance Department. Prior to work the day will start in the church with candle lighting for everyone’s intentions, festal readings, tropars, and carols. Continental breakfast served at 8 am. Ethnic lunch served at noon. Look at the project list in St. Mary’s Hall or here. 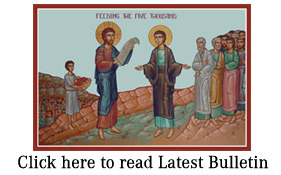 The annual Eparchial Stewardship Appeal is in progress. We have to put emphasis on this initiative to help support Bishop John’s important programs. Please return your completed pledge card soon.